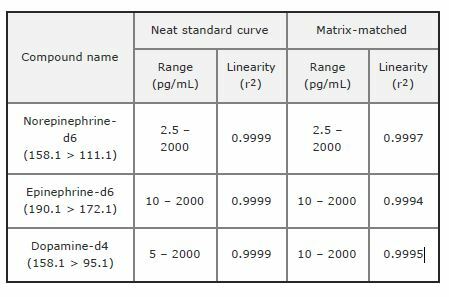 High-sensitivity quantitation of intact catecholamines (CAs) in human plasma. In clinical research, plasma catecholamines and their Omethylated metabolites (metanephrines) are measured as biomarkers for diseases such as hypertension, pheochromocytoma or neuroblastoma. It is a challenging assay as the low physiological levels of CAs, physicochemical properties, and potential interferences require high sensitivity and specificity. 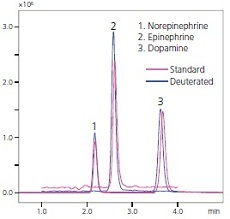 We developed a SPE-LC/MS/MS assay by using LCMS-8060 to detect catecholamines at ultra-high sensitivity without matrix interferences. As the measurement cycle time was 12 mins including the column re-equilibration the LCMS-8060 assay opens new possibilities for multiplexed sample analysis and higher sample throughput.